The CRS8/9090 is a 2-way passive-filtered full range loudspeaker, designed to meet all requirements of current and future (Digital) Cinema surround sound formats. Featuring the patented Alcons pro-ribbon driver technology, the CRS8 combines an exceptional clarity and intelligibility with an unusually high dynamic range, offering the most realistic sound reproduction possible. The CRS8/9090 system consists of one RBN401 pro-ribbon driver for HF and a vented 8” mid-bass for LF reproduction. The CRS8 HF section has an 800W peak power input, enabling a 1:16 dynamic range with up to 90% less distortion from 1kHz. to beyond 20kHz. The patented (90-degrees) horizontal and patent-pending (90-degrees) vertical dispersion of the revolvable waveguide, offers a very wide and consistent coverage up to the highest frequencies; Very important for the imaging in height channels of immersive systems. Due to the “compression-less” principle of the pro-ribbon transducer technology, the system has a fully linear response at any SPL, for an intuitive 1:1 performance. By utilizing identical MHF components as featured in Alcons’ Digital Cinema screen systems, a perfect voicing matching between screen- and surround system is realized, resulting in an exceptionally wide and uniform sound stage throughout the entire listening area. 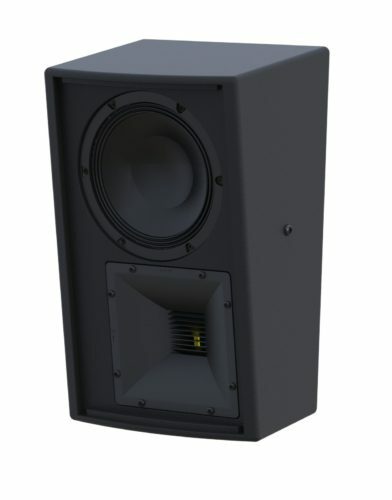 The 10-degree slanted baffle together with the upside-down speaker arrangement and the enclosure design provides for low profile wall mounting. For full system performance, the CRS8 needs to be driven by an ALC controller-amplifier, delivering maximum sound quality with increased headroom and utmost operation reliability. The CRS8 is available in 8 ohms and 4 ohms version, for maximum amplifier efficiency in individually-amplified immersive surround systems. The Signal Integrity Sensing™ pre-wiring ensures complete cable/connector compensation between the CRS8 and ALC, significantly increasing response accuracy, regardless of cable length and system impedance, with tight and accurate mid and bass response as result. Typical applications include height surround sound system for premium Digital Cinemas, high-end mix/screening rooms, as well as post-production facilities, dubbing stages and quality-conscious performing-arts theatres. The CRS8 is prepared for a Powerdrive 100 bracket, or equivalent.